So far we’ve looked at elimination of waste in solid form (from the colon) and waste in gas form (from the lungs). Now we will look at waste elimination in liquid form (from the urinary system). Adults eliminate about a quart and a half of urine each day, if functioning properly. The urinary system works with the lungs, skin, and intestines – to excrete wastes and to keep the chemicals and water in your body balanced. The kidneys remove urea (waste produced when the body metabolizes protein) and other waste substances from the blood. Included in the urinary system are: two kidneys, two ureters, the bladder, two sphincter muscles, and the urethra. The kidneys are bean-shaped organs about the size of your fists. They are located near the middle of the back, just below the rib cage. 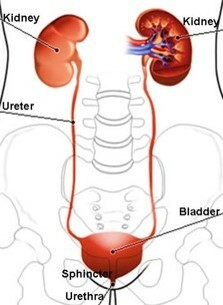 From the kidneys, urine travels down two thin tubes called ureters to the bladder. Small amounts of urine are emptied into the bladder from the ureters about every 10 to 15 seconds. The bladder is a hollow muscular organ (shaped like a balloon) which stores urine. It swells into a round shape when it is full and gets smaller when empty. If the urinary system is healthy, the bladder can hold up to 16 ounces (2 cups) of urine comfortably for 2 to 5 hours. The sphincter muscles (circular bands) help keep urine from leaking. These muscles close tightly like a rubber band around the opening of the bladder into the urethra (the tube that allows urine to pass outside the body). Nerves in the bladder tell you when it is time to empty your bladder. 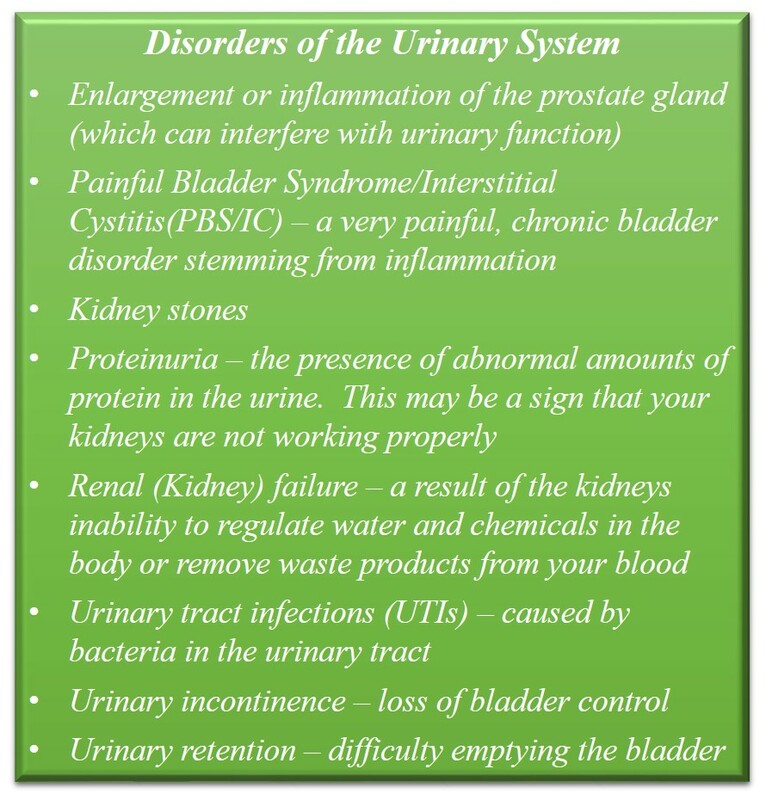 Most problems in the urinary system are caused by aging, illness, injury, or abuse. They can lose some of their ability to remove wastes from the blood. The muscles of the ureter, bladder, and urethra can (and tend to) lose strength. This can result in urinary infections because the bladder muscles do not tighten enough to empty your bladder completely. As the sphincter muscles loose strength incontinence may be the result. Drink plenty of water. How much water you need depends on a number of factors: Age, activity level, climate, diet, etc. Water will dilute concentrated urine and assist the body in flushing out waste and unhealthy bacteria. A basic guideline is to divide your weight in pounds by 2 and drink this in ounces. Parsley Green Drink. Parsley is a gentle diuretic, effective for many kidney/bladder complaints, blood builder, bactericidal, and full of minerals. Eliminate your SNAC’s. Sugar, Nicotine & Narcotics, Alcohol & Artificial Sweeteners, and Caffeine. These substances put a great burden on your kidneys. Even pasteurized fruit juice (a concentrated “acid-sugar”) puts a burden on your kidneys. Answer Natures Call! Putting off elimination means the kidneys (or bowels) will begin to reabsorb the very toxins they’re trying to pass out of the body.